Women are naturally high level leaders because they are relationship oriented. However, it's a "man's world" out there and natural ability isn't enough to help you be successful as a leader. You must intentionally develop your skills, so you can lead and influence others at home, at work, at church, or even as a volunteer. 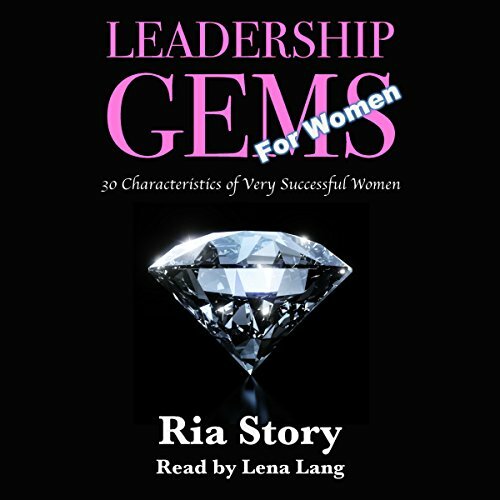 Leadership Gems for Women, Ria has packed 30 precious gems of leadership wisdom on characteristics of very successful women - and insight on how you can develop them yourself. Ria has combined her years of experience in leadership roles of different organizations along with years of studying, teaching, training, and speaking on leadership to give you these 30, short and simple, yet powerful and profound, lessons to help you become very successful - regardless of whether you are in a formal leadership position or not.